LaterDude Pro is an App that allows you to set reminders from the Call Log, Messages, Text Messages and from the Contacts List! The efficiency of this application is that these reminders get added to your Calendar or Tasks. From there you get notified to call/sms/email/contact the person back. Through this you won't forget anything anymore! To access the functionality of the app, click the Menu Button and select 'Later, Dude!'. 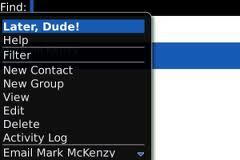 When you use this application on a BlackBerry® Tour™ or Torch™, it does not work from the Call Log. Everywhere else it does work. It is strongly advised that you read the User-Manual on how to use the application. On your PC go to "bitly.com/LaterDudePro"
In the Tasks, there is currently a problem with the reminder. It just adds it to the list. But if you want a reminder, you need to save it as a Calendar event.